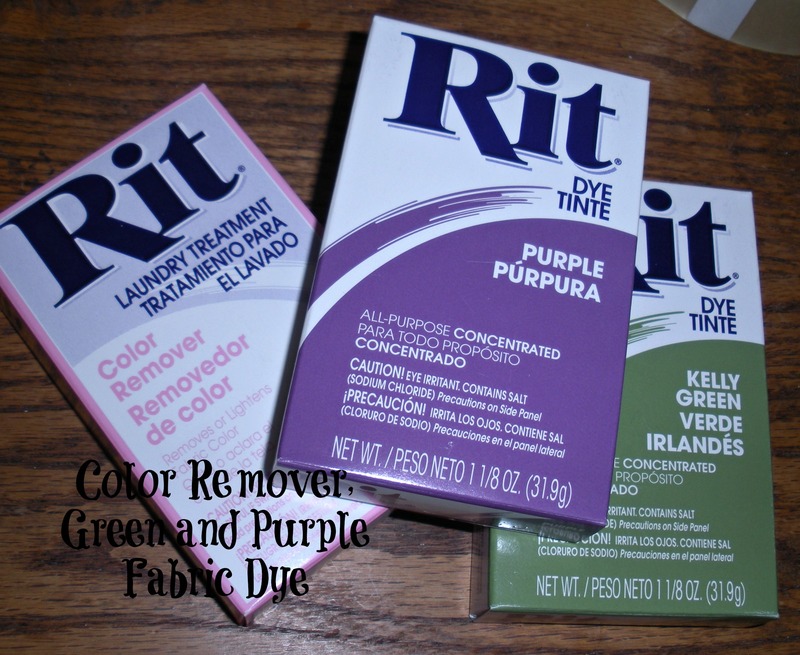 I started by washing everything, the Linen capri & blouse set and the green shirt were washed in a bath of Color Remover (which didn’t really do a thing); then I soaked the linen set in the purple dye for several hours (washing machine method). After it dried, the color was very uneven, but I got to work anyway. 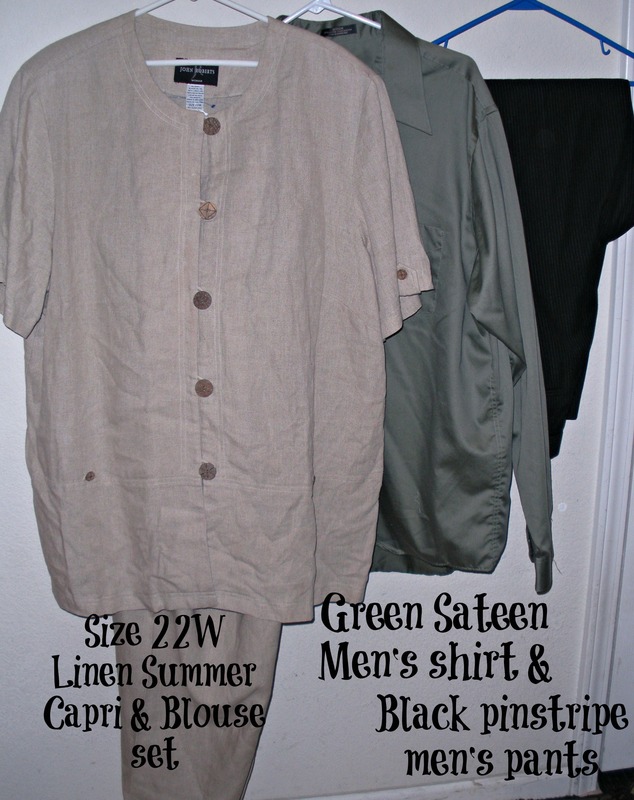 I removed the short sleeves from the linen blouse, cut long sleeves from the capri pants legs, and attached the new sleeves to the jacket. 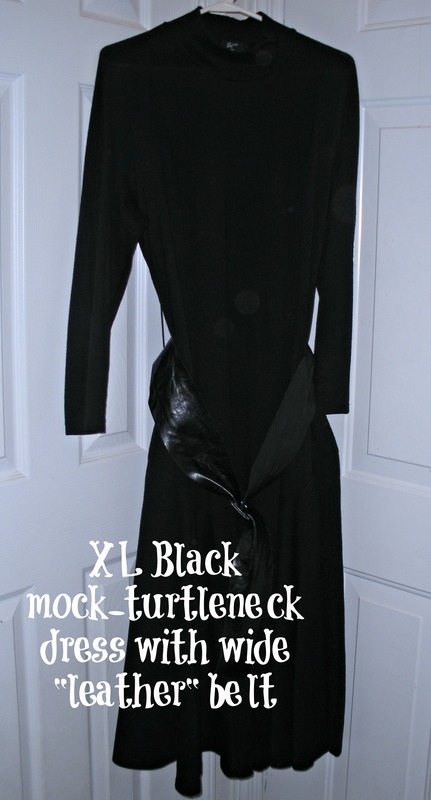 Then I cut the bottom of the blouse off, made a pointed hem on each side in the front, and added tails to the jacket (which you cannot see in the pics, sadly)–so it looked just like The Joker’s tuxedo jacket. From the scraps of fabric I had removed from the blouse and the leftovers from the pant legs, I made a collar and lapel and attached them to finish the jacket. On to Catwoman. I cut the bottom of the dress off, removed the belt loops, and attached the “leather” belt at hip level to create the Mod-look 1960s “catsuit”. The sleeves required slight adjustments to make it fit more closely — maybe a half hour sewing time, tops. Add to that a pair of black leggings and boots from my closet, and I bought a long red wig at Target for $8.00, and the cat ears and mask from our theatrical shop (painted the mask with black glitter paint and it was good to go), added elbow length black satin gloves, and a necklace from my jewelry box, and voila! 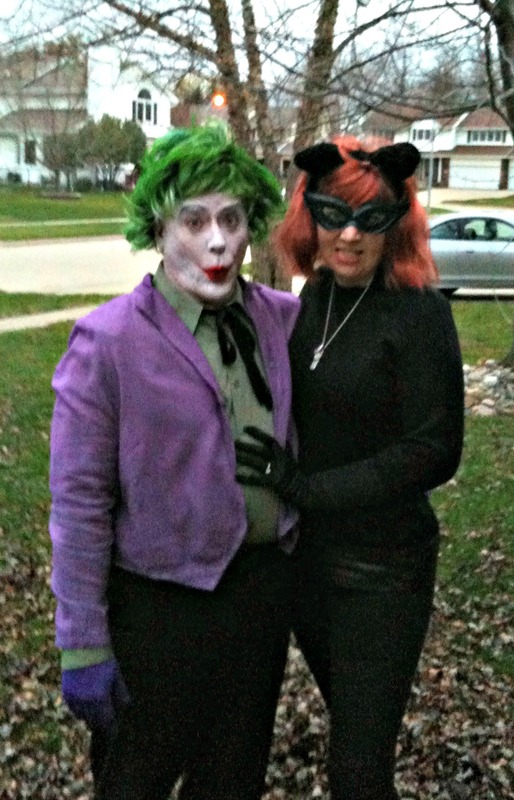 To finish off the Joker costume, we purchased green hair paint and re-painted a wig from last Halloween, and bought bright purple gloves. I cut the hem from the black dress I cut up for my Catwoman top, and tied it on him for his necktie. You are SO creative. 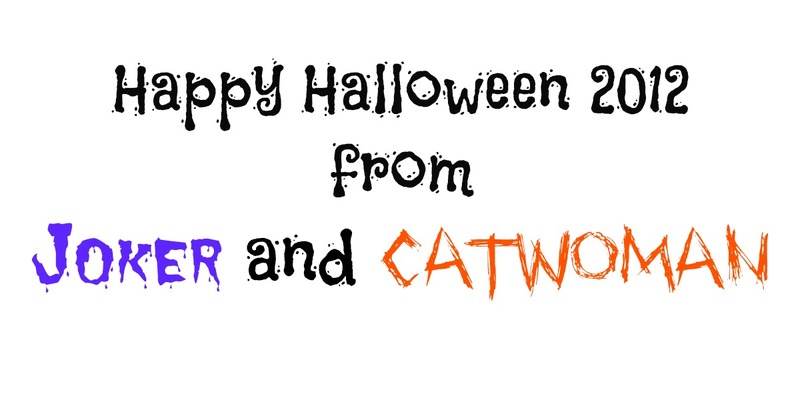 Happy Halloween you two! Thanks, Mary… it might be that I am also nuts, and that makes an interesting combination! They are so great, Doris! 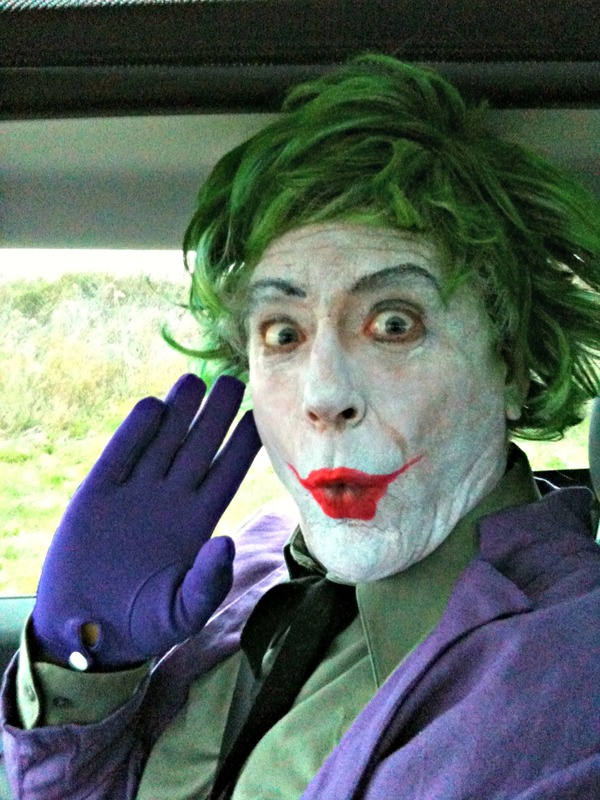 Your costumes are great, and I agree, the makeup really made his costume! 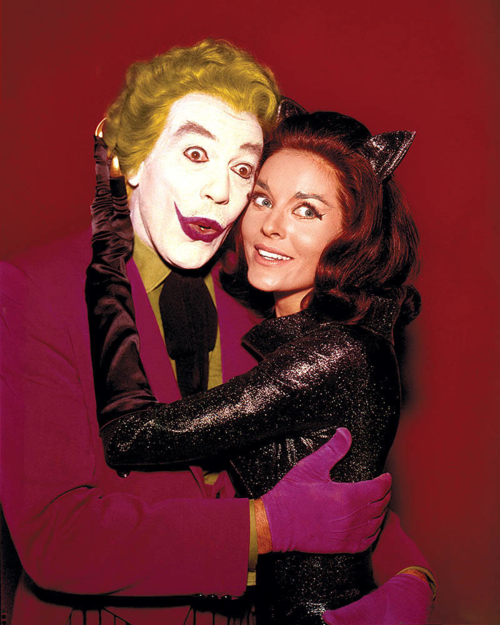 Great costumes, Doris… and I don’t even like Halloween. I do believe you’ve lost quite a bit of weight since I saw you last. You look BEAUTIFUL as Catwoman.